Liv Alexander, actress and producer, starring in Hollywood movies. Liv Alexander is a SAG signatory actress and producer actively engaged in feature film production. Liv heads her own company, STAR QUEST PRODUCTIONS. 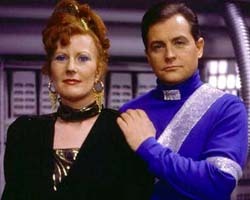 Burt Ward stars in STAR QUEST with Liv. STAR QUEST is the story of a starwoman's quest for love in outer space. As a Norwegian actress in the Hollywood world of movies, Liv is pursuing an active career as an actress and producer. Liv's other roles are starring in BUTTERFLIES IN THE WIND and THE RED QUEEN, Felliniesque Players, in which she plays the RED QUEEN. We can explore space, we can travel across the universe, we can visit all the stars and planets -- some things do not change: human feelings, human spirit, human relationships. A movie must make us feel for the human condition, we must see ourselves in the characters portrayed. This is my vision and my quest, my movies and what I am about as an actress and producer.